The valve is available in sizes 4-12 inches (DN100-DN300) with a minimum pressure at the valve inlet of 29 PSI (200kPa/2 barg). 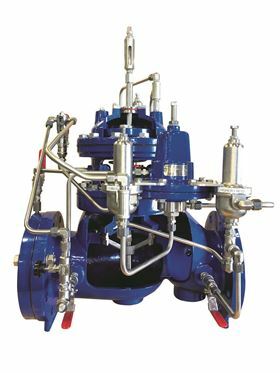 Mueller Water Products has introduced the Singer 106/206 PGM-2PR-630-SM pressure management valve with integral backup. The valve hydraulically manages pressure around the clock to reduce water loss, save money and prevent unwanted pressure spikes that contribute to premature pipe failure. Built on the Singer 106PGM or 206-PGM main valve, a simple field retrofit is possible using the paddle style orifice plate. The valve switches between high and low pressure pilots based on flow rate. The pressure reducing pilots independently adjust to suit the optimal downstream pressure. The valve requires no electrical power or independent flow signal, as it takes its flow signal from an orifice plate installed on the valve inlet. The integral backup system protects against diaphragm or pilot failure, reducing the need for immediate service.